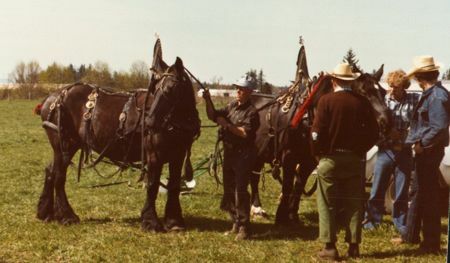 After being great fans of Draft Horses for some years, we finally got into the Draft Horse business ourselves. 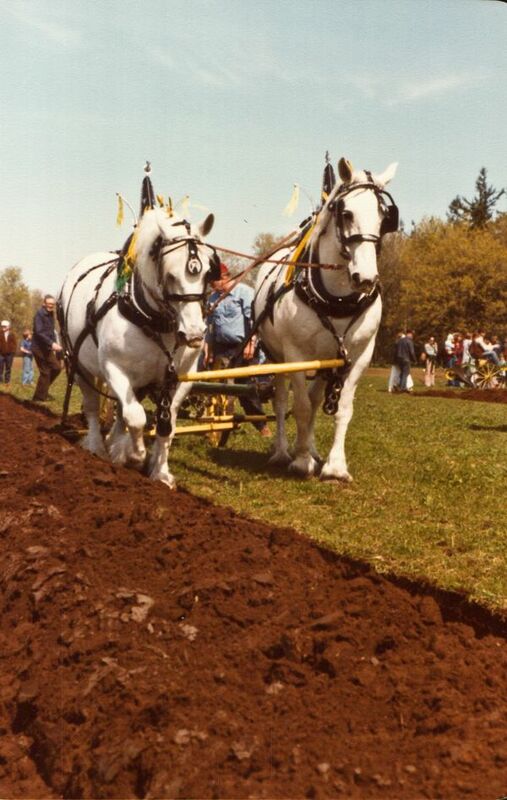 Besides our having our own "big boy" Prince, we participated actively in all things Draft Horse for about 30 years. With our livestock gone and our Farm sold, sadly this part of our lives has become mostly memories. And great ones they are! 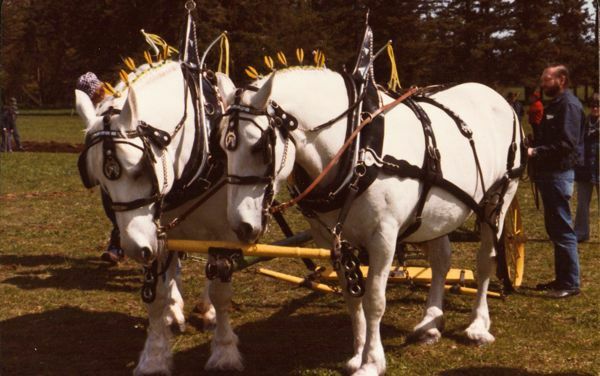 I miss their sights and sounds - and for me - a great deal - their wonderful smell - a "horse smell" that those who know - will know! The miracle that is these wondrous creatures is rich, and few things will so stimulate the senses as opening the barn door, and hearing the rustling and stamping, and smelling the life, as you proceed down the alley to the appropriate stall. I've been digitizing my photo (and music) collections - not a small task, and likely not achievable with literally hundreds of thousands of filed pictures and slides stored away. But, if not started now - then when? I'm already approaching 50,000 processed. Not a small task, but - maybe a joy and not a task at all, for as I open each package, new surprises and new memories await. Like these pictures. 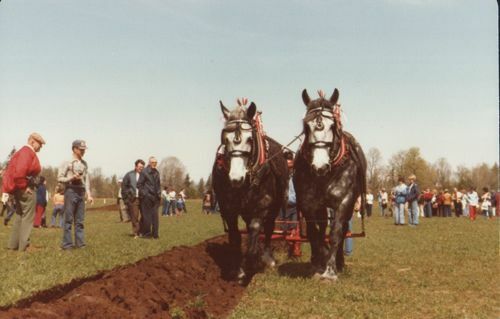 They are of the Lynden Plowing match in the Spring of 1979. Wonderful, all over again! And.... they're out on the course! 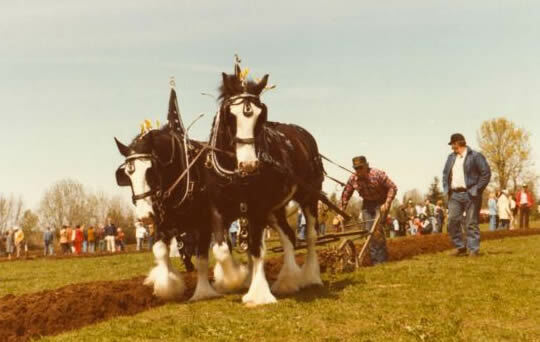 As you can see - the horse in the furrow has a much tougher job than his mate - as you can also see by just looking at their faces. This pair of gorgeous Clydes are getting ready to go to work. It doesn't get any better than this - a fantastic looking team - doing their thing. 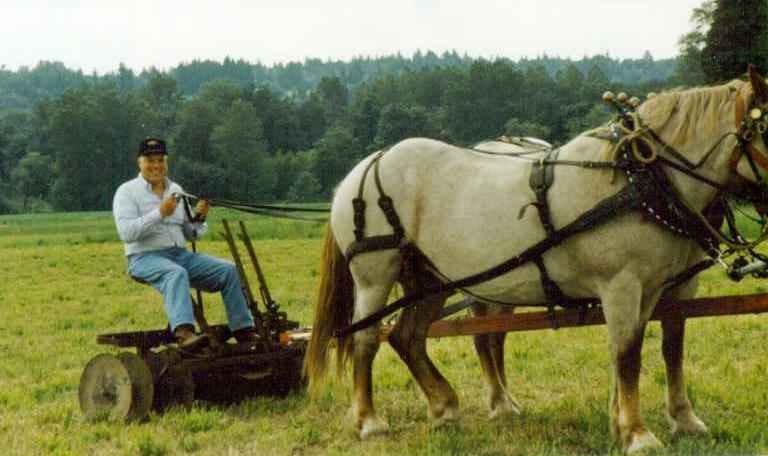 This is the ultimate in team work - a man working with his animals - quiet partners with hands and feet, bodies and minds joined in a common purpose. 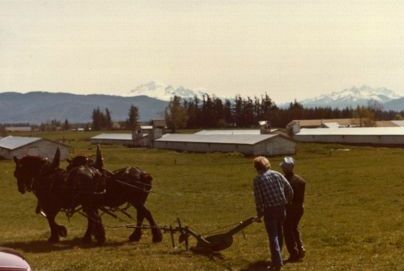 On its side, the plow is dragged to the field. And, down into the furrow with his John Deere. 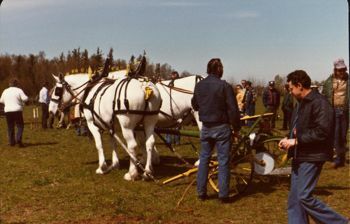 The plowman demonstrates the technique. 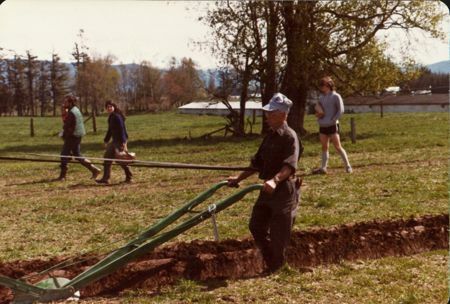 His hands guide the plow, controlling depth and direction, while his torso controls and guides the team via the lines tied around his body. Little nuances of his body movements are translated to his horses via their bit bars. Often, no words are spoken. No mean feat! This is what it's all about. It's also the ultimate example of team work. Two extraordinarily powerful animals working with a man connected to them by lines wrapped around his body - demonstrating amazing control and precision. 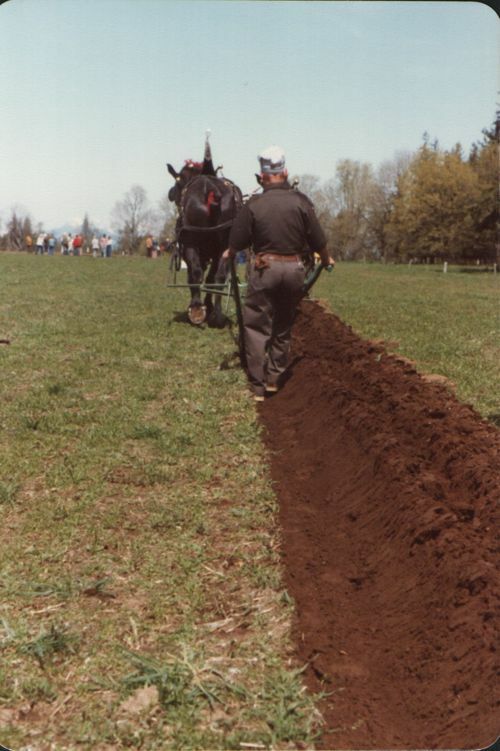 The objective is first - a straight furrow. Then a good even depth and especially a good curl - the sod round that is turned over. How's he doing? How are THEY doing? 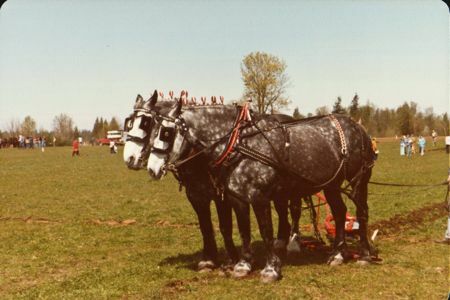 A nice pair of Percherons. 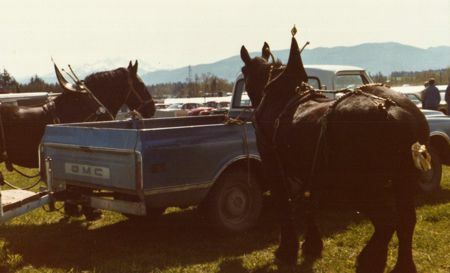 Of course, in real work, they wouldn't be all gussied up with their show harness, braided manes and ribbons. But - hey! - this is a show - a contest! Time to look your best and strut your stuff - especially in front of the competition. I do believe the horses love it! And - here they are - beautiful dappled greys - showing how it should be done. 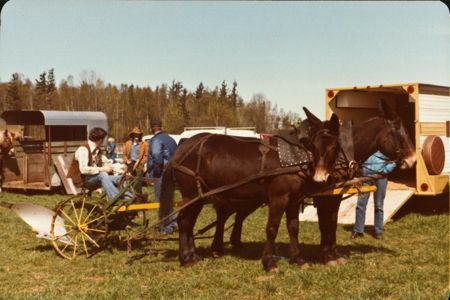 Next up are a beautiful pair of Draft Mules - hitched to a single bottom John Deere sulky riding plow. 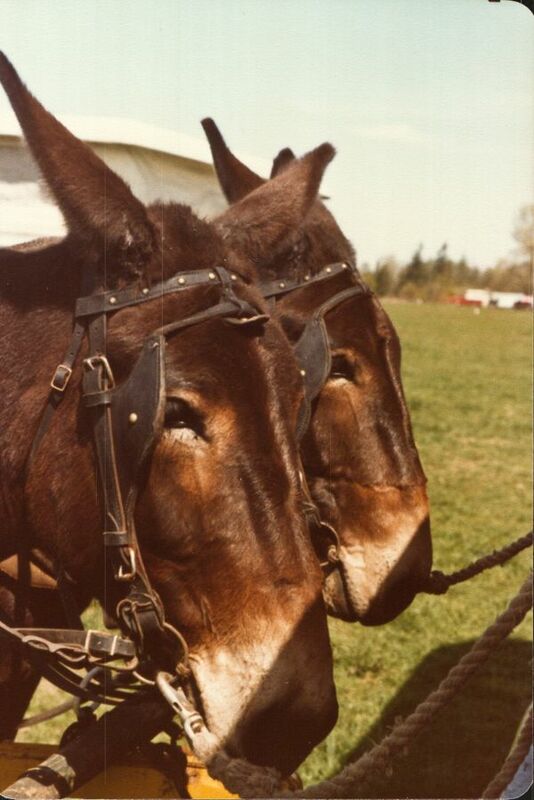 Mules are sure-footed and this pair mean business! Last ones for today. Check out the right side edge of the riding plow's furrows - a little ragged? Hey, there's more to this than meets the eye! And, that first pass is always the toughest, as you have no reference. 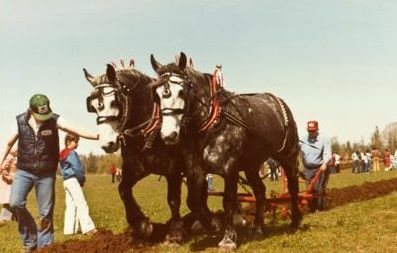 A single draft horse can normally pull a single-furrow plow in clean light soil, but in heavier soils two horses are needed, one walking on the land and one in the furrow. 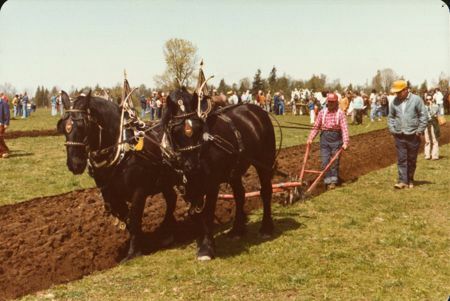 For ploughs (plows) with two or more furrows more than two horses are needed and, usually, one or more horses have to walk on the loose ploughed sod—and that makes hard going for them, and the horse treads the newly ploughed land down. It is usual to rest such horses every half hour for about ten minutes. 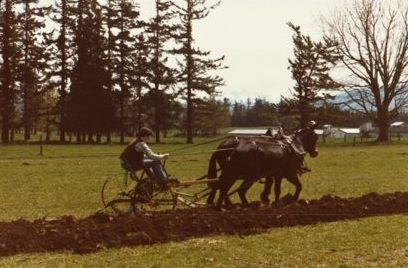 Heavy volcanic loam soils, such as are found in New Zealand, require the use of four heavy draft horses to pull a double-furrow plough. 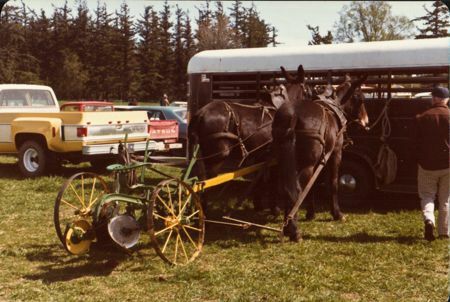 Where fields are more square than long-rectangular it is more economical to have horses four wide in harness than two-by-two ahead, thus one horse is always on the newlyplowed land. 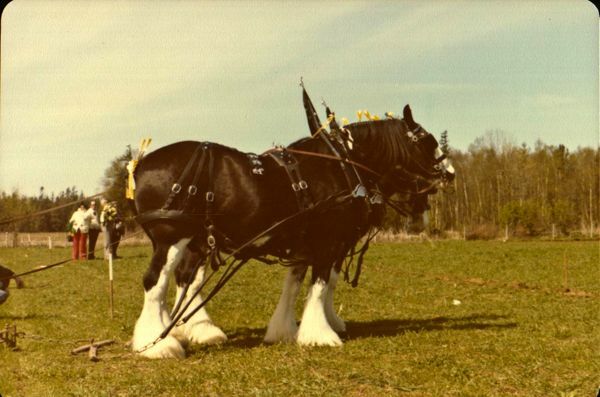 The limits of strength and endurance of horses made greater than two-furrow ploughs uneconomic to use on one farm. 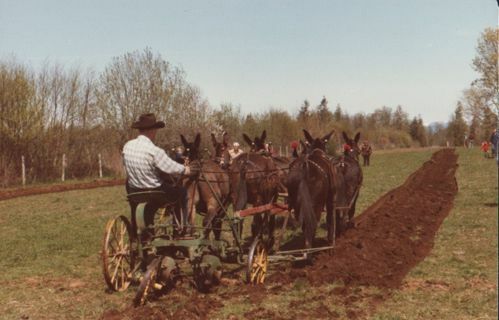 Amish farmers tend to use a team of about seven horses or mules when spring plowing and as Amish farmers often help each other plow, teams are sometimes changed at noon. 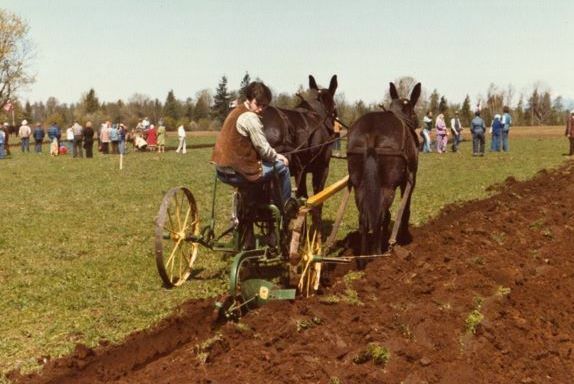 Using this method about 10 acres can be plowed per day in light soils and about 2 acres in heavy soils. Yep - that's ole Bob - trying his hand - not on a plow - I'm not that good. But, on a disc. © Copyright 2011 Robert Bogash. All Rights Reserved.